I started my journey at 6:00 in the morning in Austin, Texas. 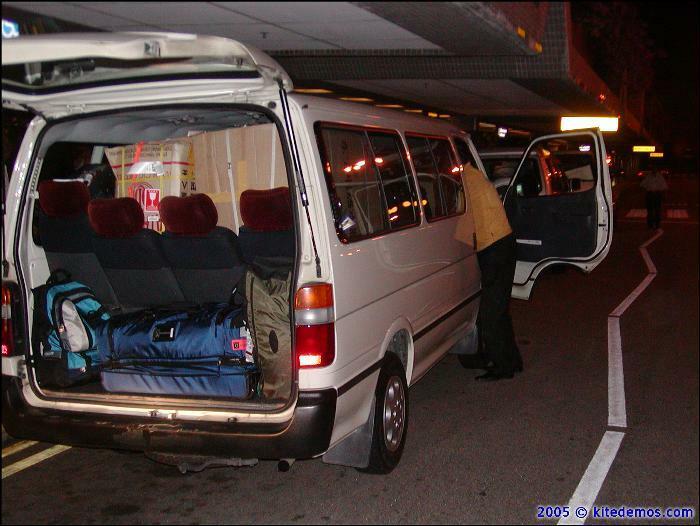 We arrived in Singapore at midnight and arrived at the Hotel in Pasir Gudang, Malaysia at 5:00 in the morning two days after we left Texas. 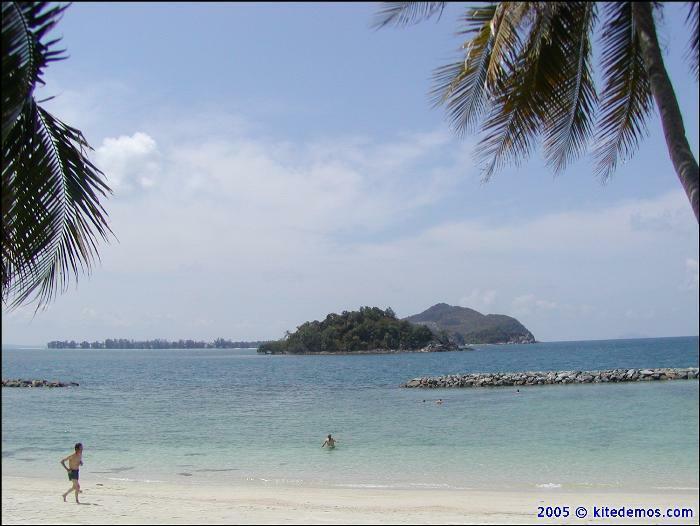 Now keep in mind Malaysia is 14 hours ahead… meaning we traveled in time. Before I left I looked around Austin for something special to give to the Sultan of Johor (Duli Yang Maha Mulia Baginda Tuanku Sultan Iskandar Sultan Johor) – in case I had an opportunity to meet him in person, Troy said it might be nice to have a gift prepared. 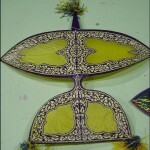 As for remembering the name, I think I will have to stick with “the Sultan” or “King” for now. 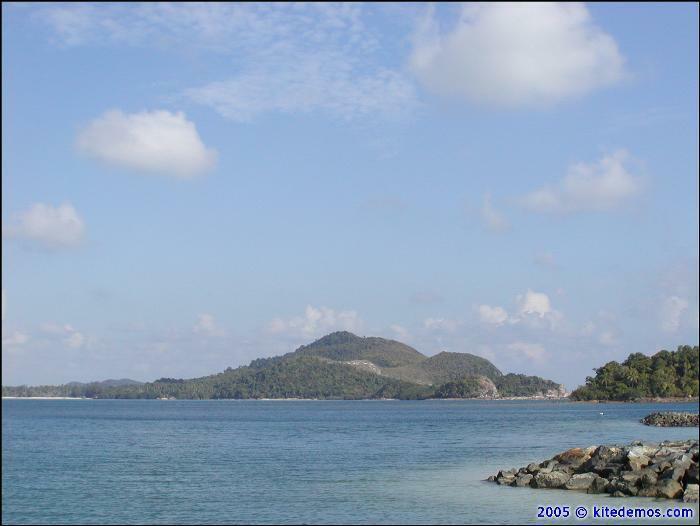 As we flew over land and sea, I wondered what it would be like in Malaysia. 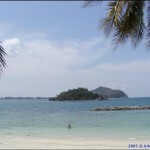 While I had grown up in the Philippine Islands, I had never been that far south in the tropics. Troy and I met up on the plane from Tokyo but sat too far apart and probably were a bit too exhausted already to talk much, but we caught up once we arrived at the Singapore airport around Midnight. 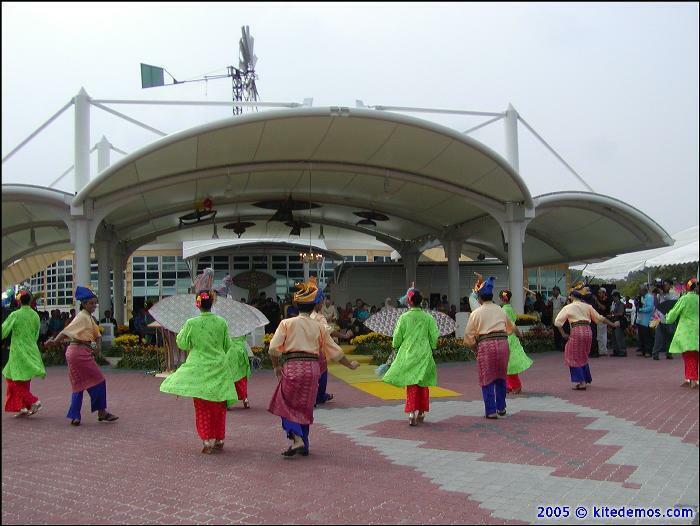 Now if you caught what I said earlier you’d think the airport was about 5 hours away from the Hotel Selesa in Pasir Gudang, Malaysia. However that is far from accurate. 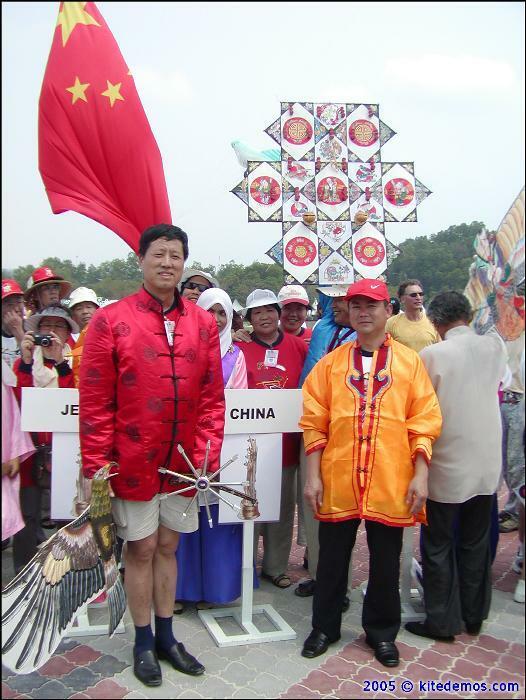 I’ve only been able to attend two Asian festivals – the first was in Weifang China in 2004 – and while it may be a bit to rash to suggest that the Malaysian festival is one of the best festivals I’ve ever attended, it is a statement which is reinforced by many other experienced kite flyers from around the world. 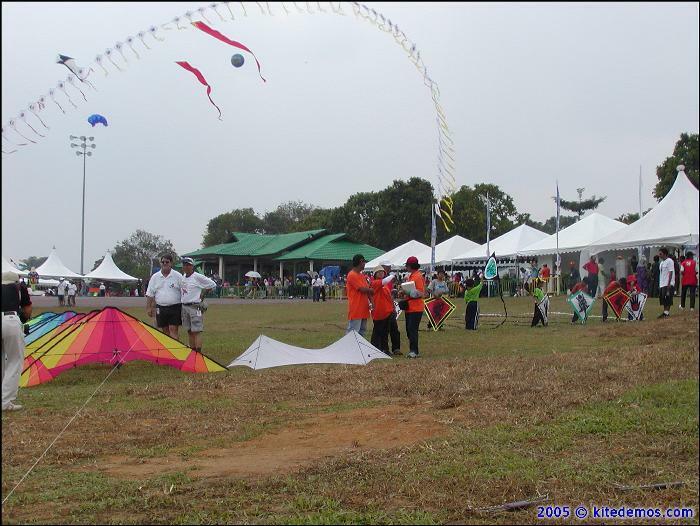 The Pasir Gudang Kite Committee is doing a fantastic job and is always looking to make improvements and open to new ideas. 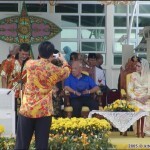 The support shown by the Sultan of Johor, the government, and sponsors doesn’t hurt either. All good intentions aside – without financial backing and support, great festivals become mediocre… however this festival is far from. 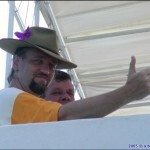 It is a truly magnificent example of what a great festival should aspire to be. 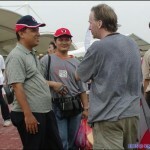 There were over 180 international kite flyers from over 25 countries. I think this makes our collective group the largest collection of delegates this festival has had in 10 years. I’m sure even the most seasoned kite fliers were as impressed as I was. 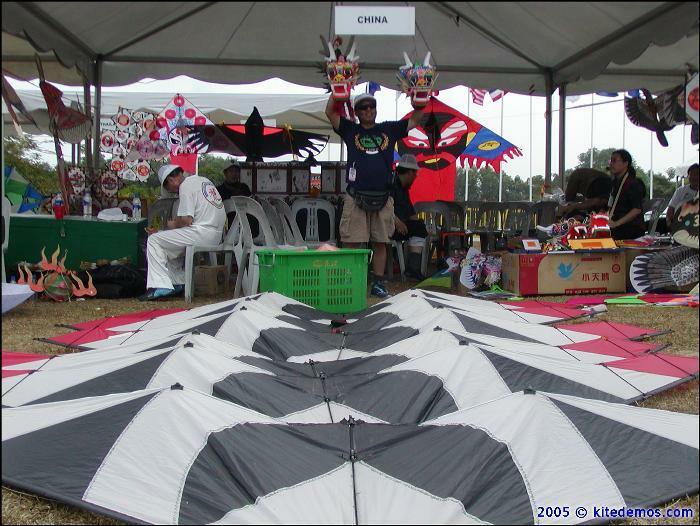 The field was graced with so many wonderful kites such as Wolfang Shimmel-Pfennings multi-facet Christmas Tree Kite from Germany, a small collection of Peter Lynn inflatables from New Zealand, a beautiful Chinese Eagle kite that soared and gracefully flew like a real bird in the skilled hands of one of the Chinese participants, a beautiful white delta designed by Helmut Georgi from Austria, and from Indonesia a playful stack of China men, and an awesome biplane looking kite. 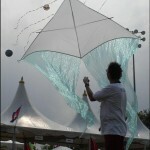 Everyday the kiters would pull out some of their favorites to create a fascinating display for thousands of spectators. 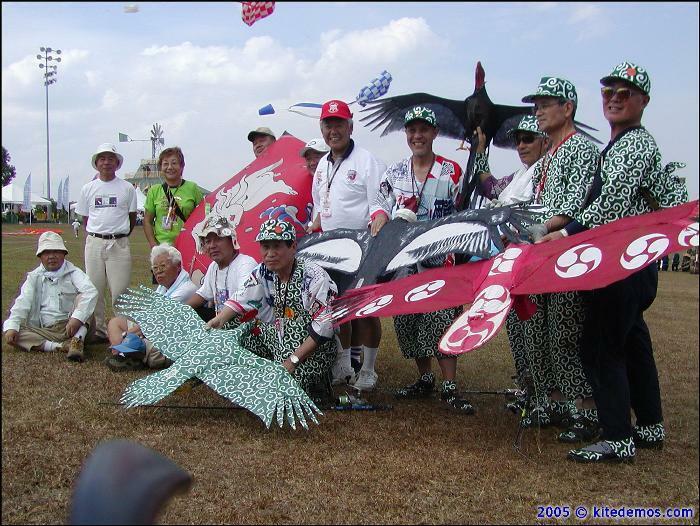 The rokkaku battles were amazing, the team from Xiamen flying Tramontana kites, and the incredible collection from Japan which featured hand painted Samurai caught in battle, various birds, Vietnamese Gold Fish. 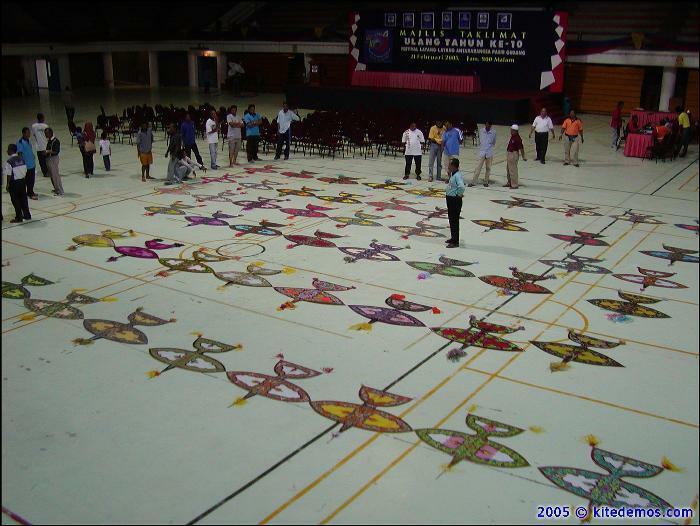 My Synergy Deca koi – a rare design created by Tye Billings and Marc Ricketts back in 1994. 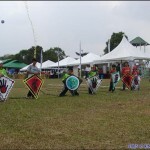 While Troy was caught off guard with impromptu dual sport kite ballets to traditional Malaysian style music a couple times, his performances still received enthusiastic responses – even Troy practicing is always impressive. If you attend this event as a special guest you should know – no matter where you are on the field you may be expected to suddenly perform. It’s all part of the fun. Things I was most impressed by were the following; a 24/7 secured storage facility on premises large enough for over 180 international guest kite collections – for me this is a Godsend. 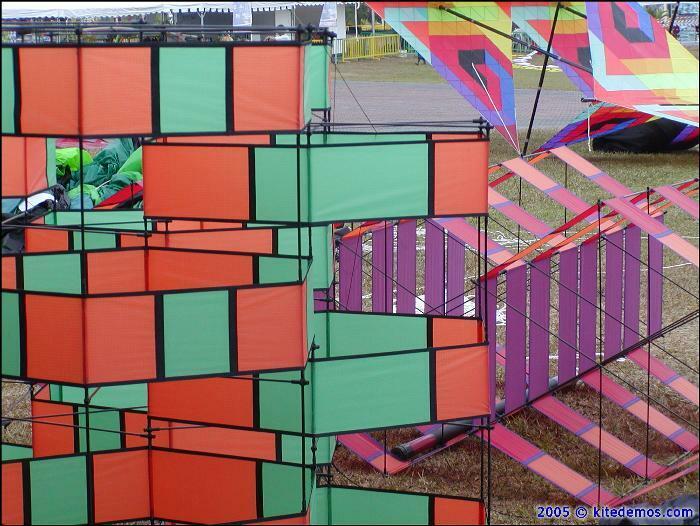 I fly a 9 stack of 10 foot kites and it takes almost 40 minutes to put them together and about 30 minutes to take them apart – it’s not something you want to do everyday. So to be able to put them together and leave them together allowed me more time to fly kites and have fun and less time setting up and taking down. 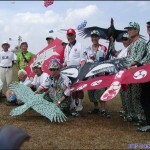 This was true for many flyers who brought large complicated kites such as the Indonesians, the Japanese, and Chinese delegations. 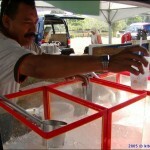 While there was a little shortage of water a couple of times – for the most part the liaisons and event organizers made sure all the guests were hydrated and well fed. 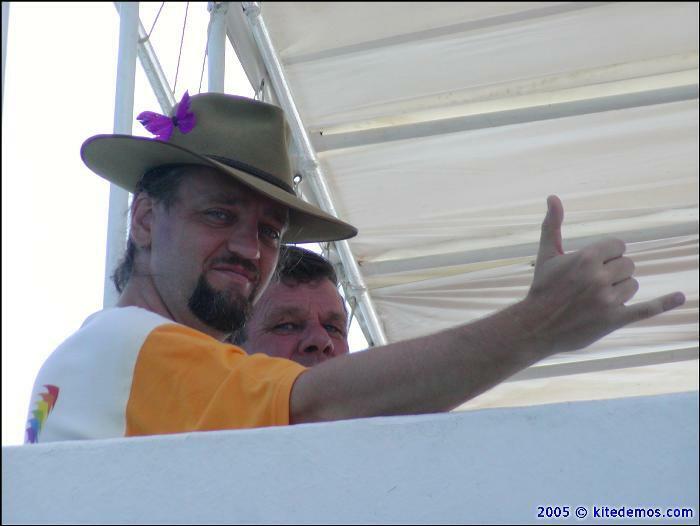 We typically had a bottle of water thrown to us every hour or so, and with temperatures over 90 degrees and humidity levels over 70% we needed it. Sure, Texas (Troy Gunn’s and my home state) is hot and humid too, but this is the tropics and it took me by surprise one day. Each group was assigned liaisons to help care for, manage, guide, and translate for each international guest. 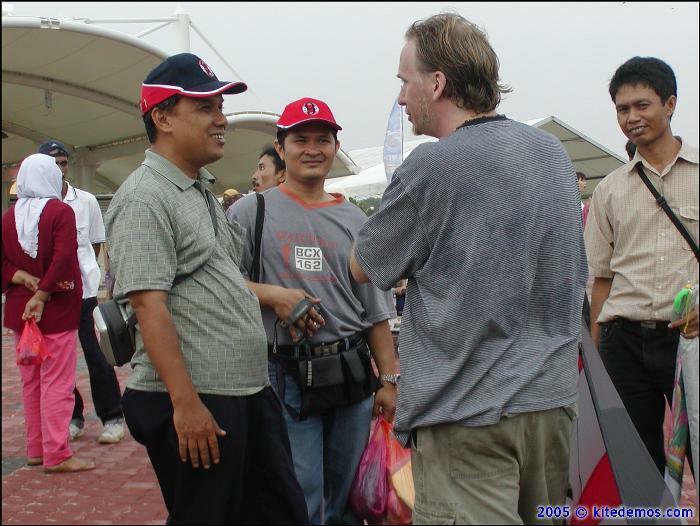 As a typical American that only speaks a single language, having a translator during an international event is a great thing to help bridge the gap and build relationships. Pointing and drawing images with your hands will only get you so far in a conversation. Waiting for the King to Arrive! 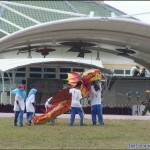 After flying kites for three days, we were finally going to perform for the Sultan of Johor. 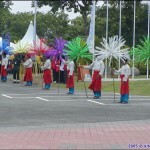 All of the delegates gathered in half circle to welcome the Sultan, members of the royal family, their guests, and sponsors of the kite festival – each delegate standing respectfully behind a sign to represent their country. 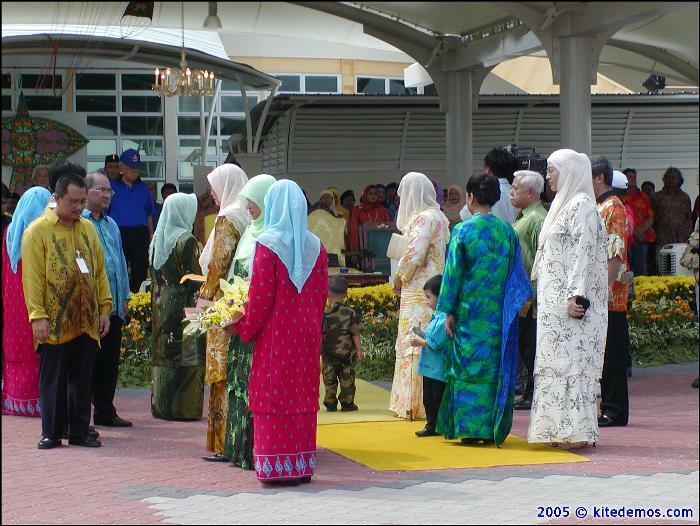 While standing in the tropic sun without shade for an hour is not the most ideal conditions, it was the least we could do to show our respect and appreciation for the support the sultan provides this festival. 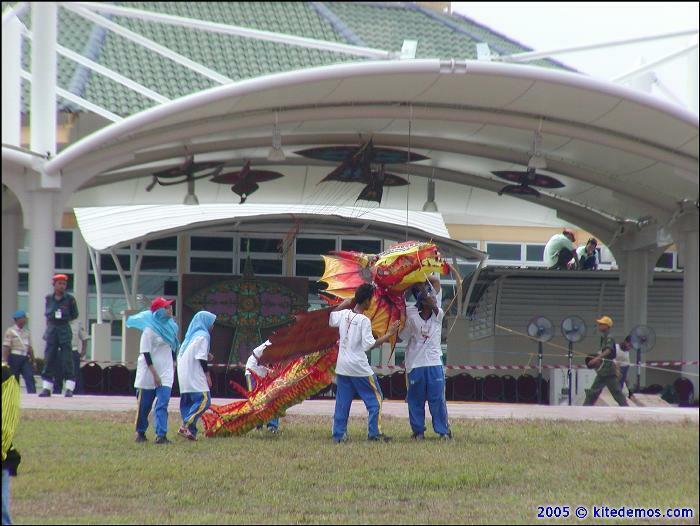 Not to mention, it was a great opportunity to meet the other flyers, see some of their best kites, and watch a couple of traditional dance routines by local Malaysian dancers. 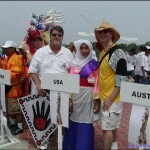 We were told because of health conditions there was a change in the usual procession and we would not individually be meeting with the sultan personally and instead he would just come out to honor the few flyers that been in attendance every year for 10 years. 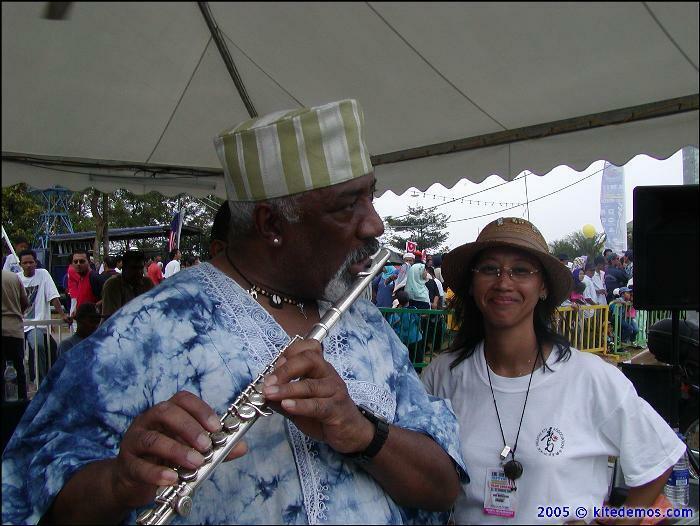 Hopefully I will in gain that position for the festival’s 20th anniversary. So the small gift I picked up in Austin I guess will have to wait until next year. 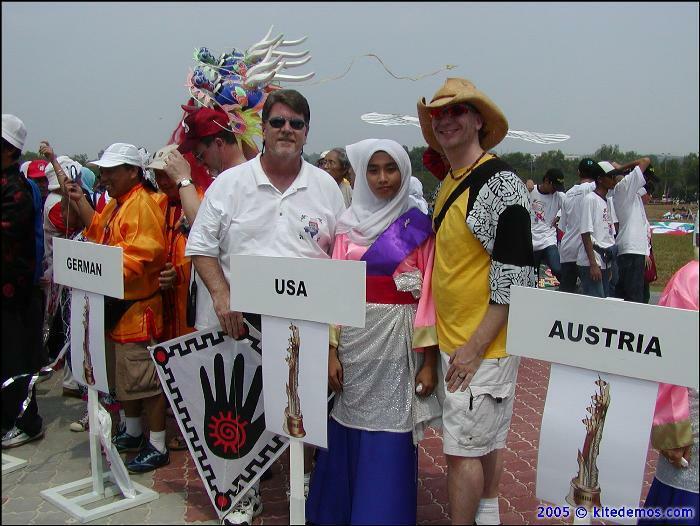 Soon after the Sultan arrived, and after a couple performances, he walked out to meet Masaaki Modegi from Japan, Michael Alvarez and Roger Martin from Australia, and Peter Lynn from New Zealand. 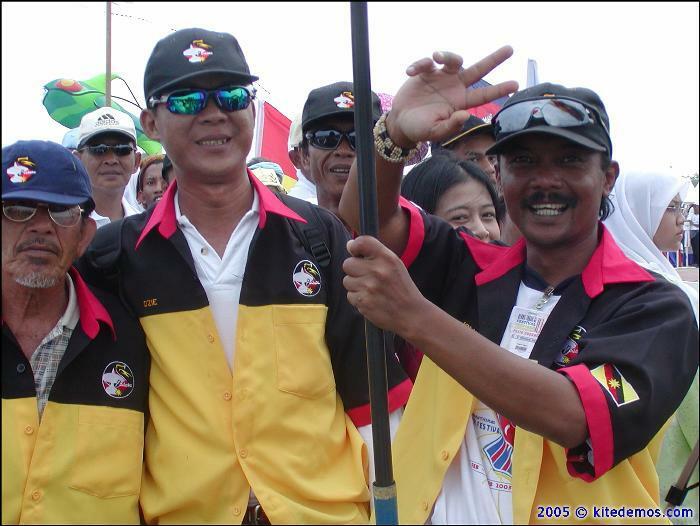 Right after the opening ceremony, the traditional Malay and Wau Kites were launched and flown in honor of the Sultan. 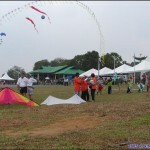 After the single line displays Troy Gunn started his dual kite routine but this time – for the first time ever – he was asked to fly to traditional Malaysian music (luckily it was the same music he flew impromptu to previously, so he did a great job as always.) The winds were light but he made it work with the New Tech Desire ULs, which fly in as little as 1 mph. With the help of Troy (USA), Gadis Widiyati (Singapore), James Sampson (Ghana), Hafsa (Malaysia), Suzi and Eddie, and 7 Malaysia children we put together the most spectacular show I’ve ever done in less than 6 minutes. The performance started with James performing live Traditional North American Indian style flute music (which he learned from music I downloaded for him just two days before), and while he played, each of the 7 children launched 1 of 4 Traditional Diamond kites with North American Indian motifs which I designed for New Tech Kites. 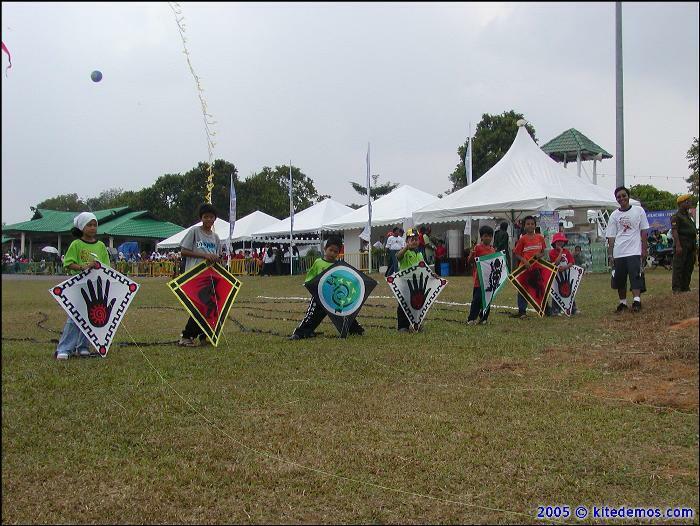 Once the children had crossed in front of the Sultan to the other side of the field, I launched the Great Zero Wind Deca by Guildworks. This cued the DJ to start the CD and cued James to merge his live flute with the European tone of Sarah Brightman. 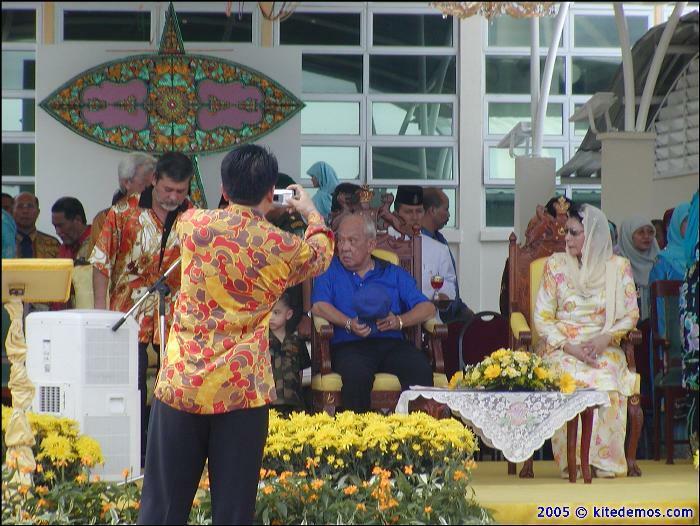 Once the CD was in full swing, I had managed to work my way over to where the Sultan and his family sat comfortably. This for me was the highlight of the show because it gave me a chance to make eye contact and get a nod from the King. I missed my cue, but still managed to get the 9 stack of Maximas launched, while the unintentional landing at the end took me by surprise. 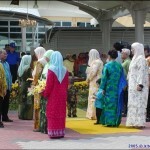 I still received a fair amount of applause and slight waive from the Sultan. Following our performance was one by the Chinese delegation which included members from Weifang, Beijing, and Tsingtao… I only caught a glimpse of their performance. 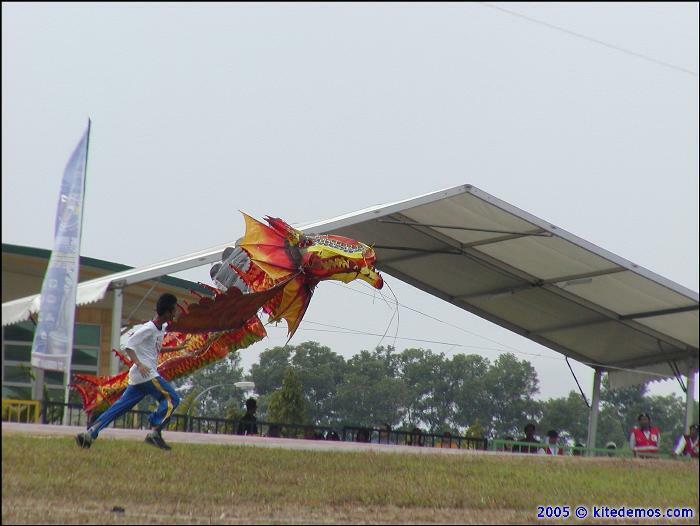 But what I saw was very impressive – a 100′ Double Headed Traditional Chinese Dragon kite, a beautiful Whistle Kite, and an elegantly flown eagle kite in the hand of one of the most talented single line kite flyers I’ve ever met. I know there was another sport kite demo by another flyer who flew two kites. I’m sorry that I can’t provide more details, and sorry to those flyers I may not have mentioned, but being one of the performers I tend to get rather self-absorbed and considering this performance consisted of over 15 people for a 6 minute stunt kite demo – I kind of had my arms full. 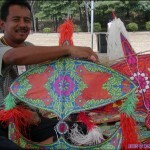 Fantastically executed logistics aside – let’s talk about culture, the local flyers, and the traditional kites from Malaysia (called the Wau). 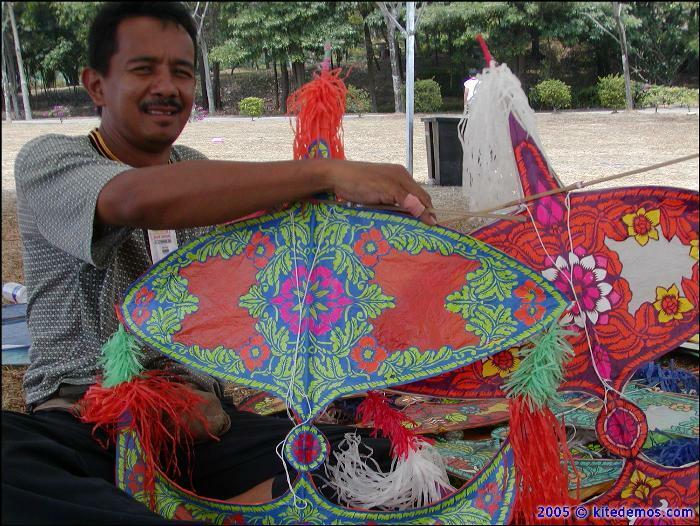 From what I gathered during my limited time and exposure to Malaysian culture, I gathered that there is a sincere appreciation for color and intricacy as shown primarily in traditional Batik clothing, and within the traditional Wau kites. Even though I typically wear black – I found being surrounded by so much color was refreshing. 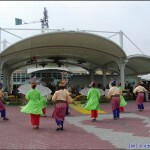 The people of Malaysia that I encountered during the festival were fun people, warm, and receptive. 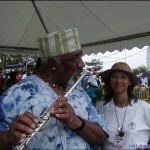 As an entertainer, it is difficult to perform for a crowd that does not let their imagination play and when a crowd responds with oohs, ahhs, and gasps of surprise, it makes performing more fun and inspires the entertainer to try new things, which in turn fuels the spectator’s excitement, which in turns fuels the performer… This was a great part of this festival for me… the general public, the Malaysian people themselves. 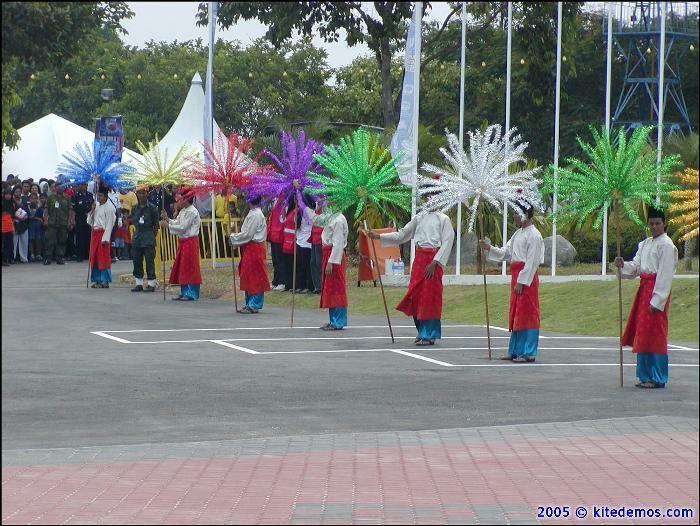 Performing for the Malaysians, I think, helped all of the international guests because they gave us energy. Their excitement and enthusiasm helped fuel our own enthusiasm. 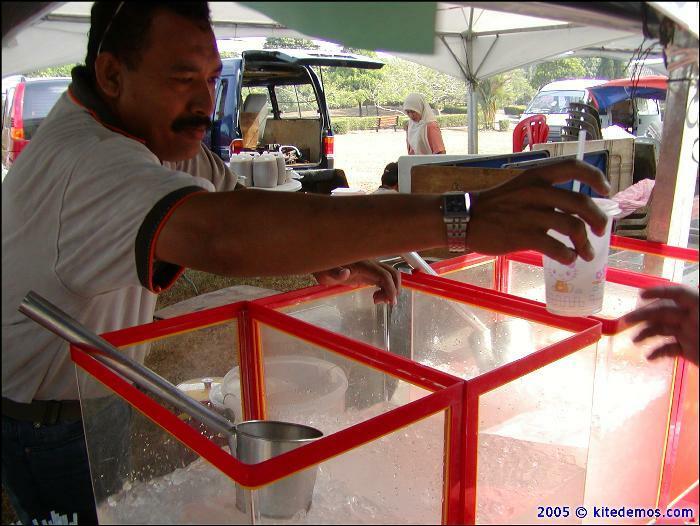 As for the food – fresh mangos, coconuts, papaya – commonplace within the tropics, were in abundance in Malaysia. But what was new were some of the salty dried fruits and vegetables, cured dried meats, and the pickled fruits and vegetables caused my mouth to water – sometimes water too much. Another favorite was Otak Otak which consisted of pulverized prawn or fish wrapped in banana or palm leaves and roasted over hot coals (Mmm… great stuff after a long day of kite flying). Dinners consisted of floured prawns, spicy crabs, fried rice, fresh fruit, spicy soups, spicy green beans, and (as always) things I never figured out the name of or how to pronounce, but it was all good. Wow, check out the Wau! 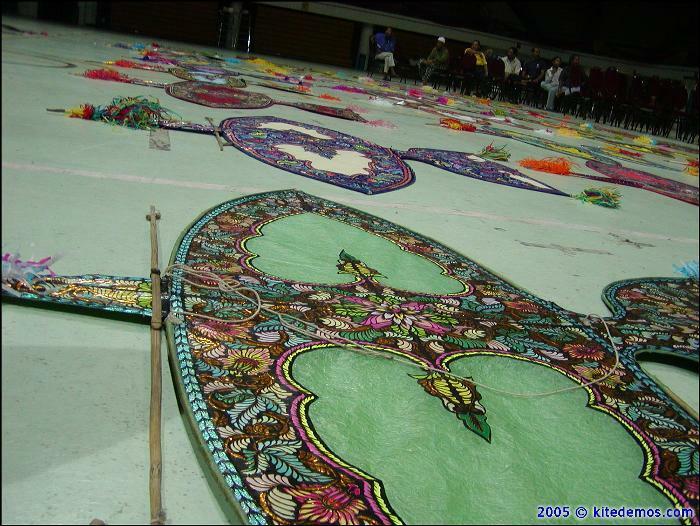 Some of you may be familiar with these beautiful kites from Malaysia, but this was my first encounter with so many different styles and shapes. 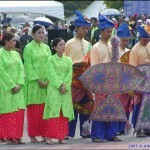 There are roughly 20 different styles, 3 of which are considered the “National” Wau. 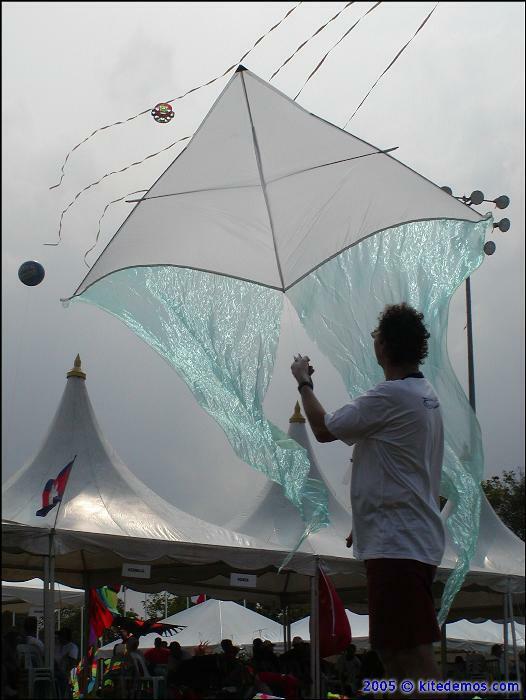 Imagine spending over 20-40 hours on a kite made of paper, bamboo, and sometimes palm, and then consider flying it and risking serious damage. 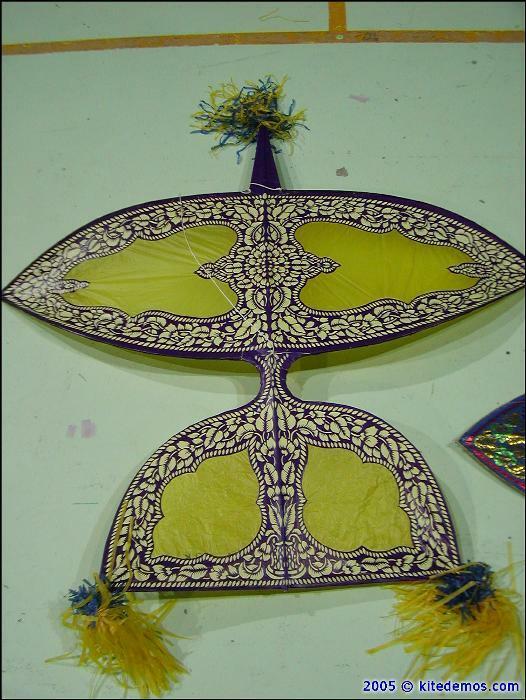 Luckily though, the kites are made quite sturdily and are often so masterfully built that the kites fly well and without much risk of destruction. 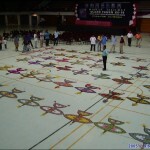 Not to mention, since most of the Wau flyers designed and built their own kites, they could easily repair them. 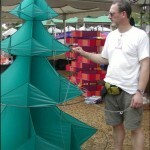 The kites are made from custom cutting, shaving, and bending bamboo and palm using string for the tension to help create many similar but unique frames. 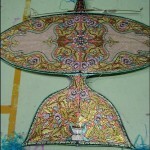 Each frame is then covered with layers of paper which create unbelievably complex and intricately beautiful patterns. 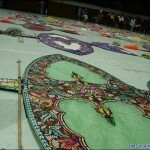 My words wouldn’t adequately describe these wonderful kites, so I made sure to take plenty of photos. We were fortunate to experience part of the Wau competition many of the guests didn’t know about off the competition fields. We were in for a treat. 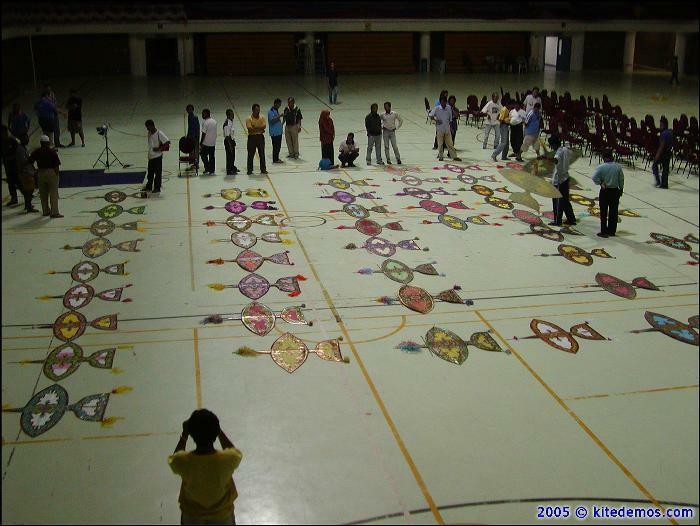 The Wau are laid out on the floor of an indoor sport stadium (which also makes for a great banquet hall and indoor kite arena.) Once the Wau have been measured, they receive an official stamp of approval. 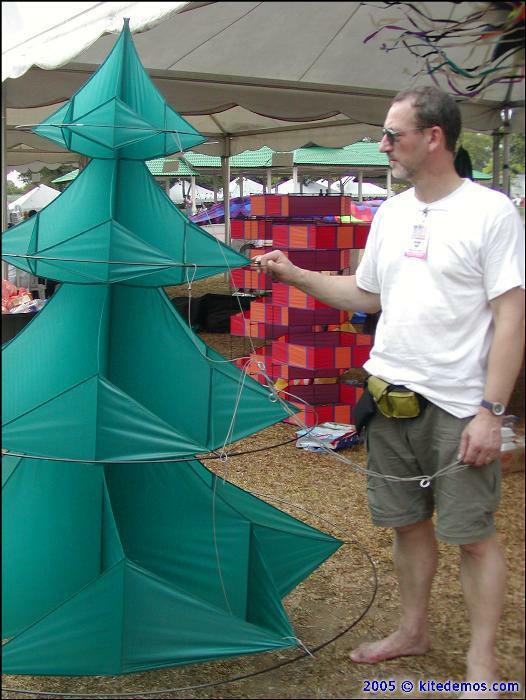 Once approved, the competitors lay down their kites in rows so the judges can review them for color use, style, and design accuracy, quality of construction, sail smoothness, and balance. 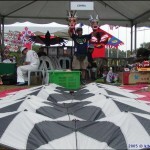 Some of the Wau are built specifically for creative and artist competitions only and others (many as equally beautiful) are built for flying competitions. 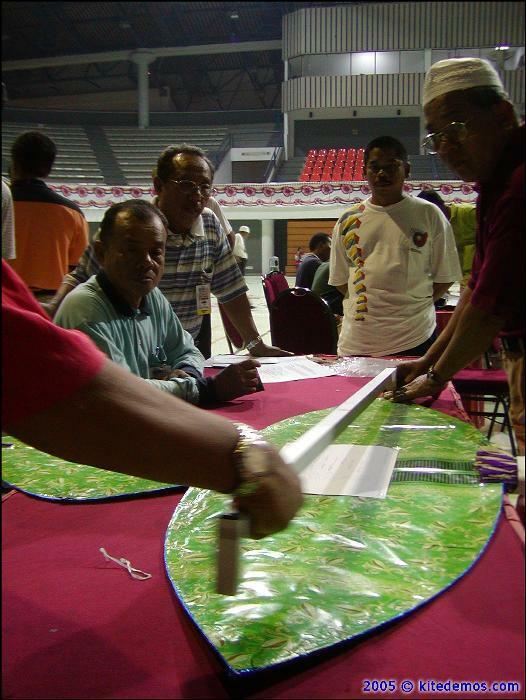 I tell you if I had spent 5 hours a day for 2 months designing and building my competition kite like Mohamed Said (a Malaysian Kite Builder) and like many others, I’m not sure I would want to fly it. 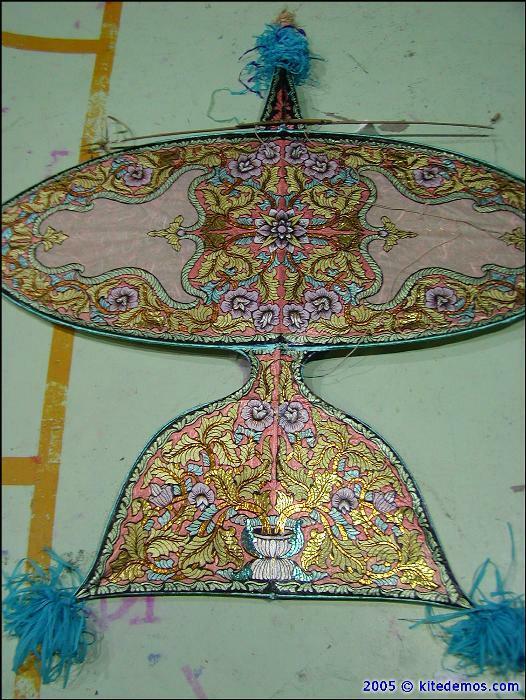 But they do – and often the kites fly flawlessly… a testament to the years of tradition and a diligence to accuracy. 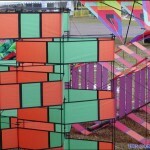 Leave the kites behind at a kite festival… Where were we going? 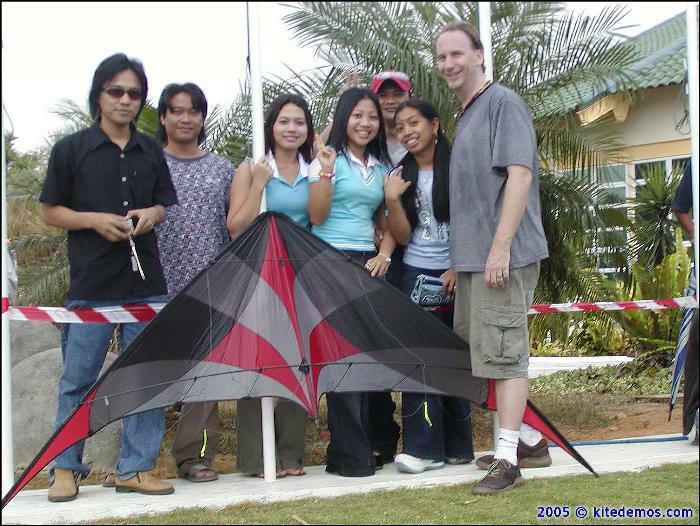 Imagine flying kites for 5 days in a tropical paradise called Malaysia, surrounded by some of the most talented, experienced, sometimes notorious, kite flyers from all over the world, and for some of the most generous sponsors, and most imaginative audience. 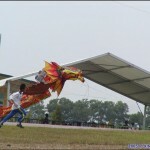 Our sponsors know we, as professional kite flyers, work very hard to put on great shows. Even though we all have a ton of fun, they wanted to provide a special treat. 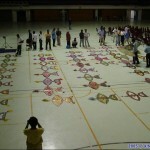 Unfortunately, only 70 of the 180 guests were allowed to go due to reservation issues but it’s the thought that counts. 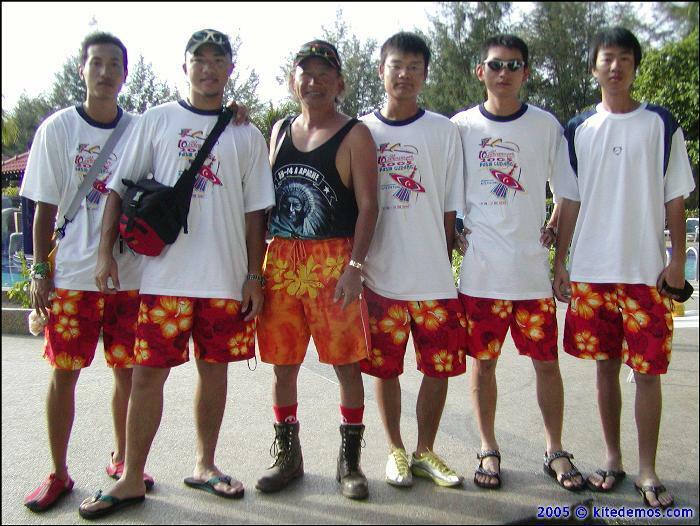 After the kite festivities, we were told to just grab a small overnight bag, swimsuits, and sun block and leave the kites behind. 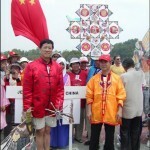 Hmm… Leave the kites behind at a kite festival? We all hopped into three coach-style buses and drove 1.5 hours to the waters edge, where we were escorted to one of two tour boats and then we headed 40 minutes out to sea. 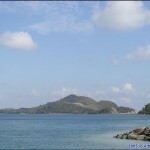 In the distance we could see several small islands, and fishing camps. 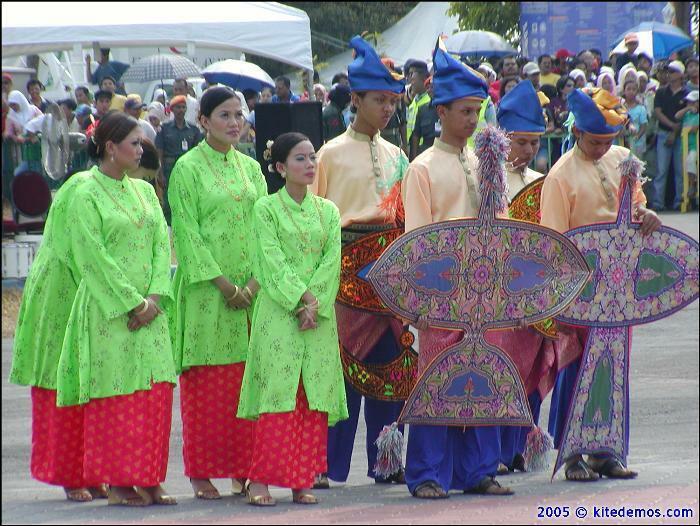 This entry was posted in 2005, Events / Festivals, Issue 41 (Mar/Apr), KL Archive, Reports and tagged festival, layang, malaysia.